Our old but newly purchased farm house had been exactly what we wanted. Of course it needed lots of work but we were ready for the challenge. I was a new mother; totally absorbed in the needs of our precious baby boy, wanting him to be warm and safe but also raised in our new “back to the earth” lifestyle. Doug and I had been married for three years and both knew even though we came from traditional neighborhoods, we wanted to start our family life on a farm. When we found the old 1840 farm house on 9 acres of land, we bought it right away. Overwhelmed with both the joy and work of being new parents and home owners we were excited to spend our first Christmas together as a family in our new/old home. The fact that we had no money for gifts and holiday decorations meant little to us. We had each other, our beautiful baby and the prospect of creating the farm life we both wanted. In a wooded area behind the house we found our first Christmas tree. Needing to be frugal, I decided all the holiday decorations and gifts would be hand made. I do remember buying tiny white lights for the tree but the rest of the ornaments were decorated cookies; hand stitched felt creations and many strings of popcorn and cranberries. In the process of making gingerbread cookie ornaments I also decided that a gingerbread house village on the fireplace mantel would be a wonderful addition to our homespun décor. We carefully cut out templates, rolled the rich brown dough, cut it into walls, roofs and floors and finally, after hours of work, assembled the houses with carefully piped on royal icing. Our farm house was filled with the spicy aroma of gingerbread and we proclaimed the houses “works of art”. My plan had been to carefully wrap them when the holiday was over and place them in our new chest freezer, preserving them for next Christmas. Arranged carefully on the fireplace mantel the village brought many “oohs” and “ahhs” from friends and family who visited during the holiday season. We were proud of our display and relieved that next year we would be able to return these time-consuming creations to the same spot. As the holiday season ended it was with great sadness that we finally agreed the tree and decorations must come down. Our tree was moved outside, still adorned with stale cookie ornaments and strings of popcorn and cranberries. We looked forward to watching as birds, deer and other animals investigated and took advantage of our free food offerings. The gingerbread village was the last to be removed. I had saved holiday boxes and wrapping in preparation for the careful packaging I knew it would take to preserve them. We set up a table and with everything in place; Doug reached carefully for the first of our seven artistically created masterpieces. What happened next would be told to family and friends for years to come. As Doug lifted the first house from its snow scene setting of mounded poly-fill, we gasped in disbelief at the empty space where the houses back wall had been. The well made structure stood with its front, roof and sides but an almost totally consumed back. There in the space where the building had been was tiny evidence of visits from what we assumed was a very well fed field mice family. We set the house (now just a façade) down on the table and began to remove the rest of the carefully made village. Not only had mice been at one house but all of the houses were missing their back walls and in some cases the meal had progressed to the side walls as well. We had been careful not to disturb the village once we had the winter scene exactly the way we wanted it; now we realized all the mounds of poly-fill surrounding the houses had provided a safe entrance and exit for our hungry village visitors. Today thinking back on the incident I laugh at the thought of these furry little creatures dinning on gingerbread throughout the holiday season. On that day, however, as the village was moved to the trash and not the freezer, my thoughts of them were not at all kind. We still live in the old farm house. Our baby boy, now 45, has two children of his own and we were blessed with another son, now 42, also a father of two. For years the farm flourished as we raised our own vegetables and fruit; later adding chickens, pigs, bees, sheep and Christmas trees to our farming experience. We eventually added more space to the tiny farm house and replaced the fireplace with an efficient gas stove with no mantel to accommodate a gingerbread village restaurant. I reflect back on the years when motherhood and farming filled my thoughts and waking hours. You would think that placing all of those partially eaten houses in the trash would have ended gingerbread house making for good; but you would be wrong. Most years following the great gingerbread village fiasco we have returned to the activity, enjoying the fun and togetherness associated with creating new villages. As the boys grew they became avid gingerbread house designers. Even through their teenage years and beyond; they would invite their friends and eventually wives to join in the fun. Today my heart continues to be filled as our four beautiful granddaughters eagerly join in to complete the circle of our tradition. Even with the hectic pace of the holidays we still make time for this important family activity. Today I pre-make the houses, giving everyone more time to experience the fun of decorating and designing their own unique creations. We laugh, eat, create and everyone takes home their own decorated house to add to their holiday décor. What most don’t know, however, is that when the holidays are over and the decorations taken down; I take my houses into the woods and quietly place them among the trees. 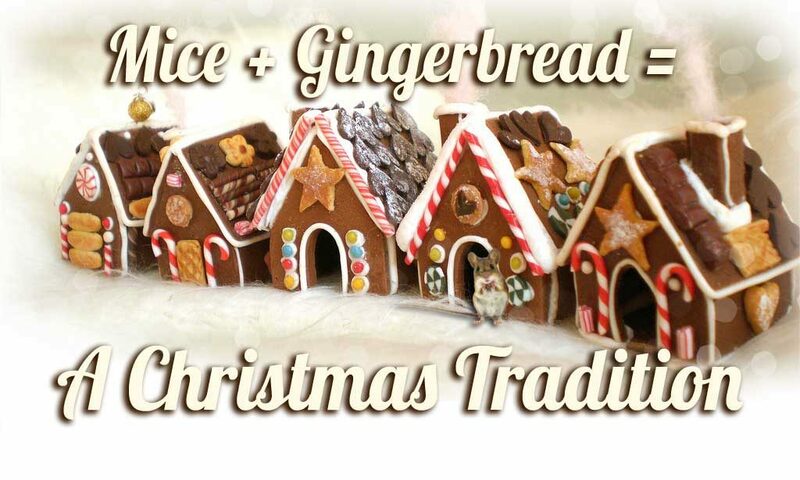 It is my way of saying thank you to the mice, who so long ago filled themselves with gingerbread and started a tradition that continues to bring our family holiday fun and precious time together. May your holidays be filled with laughter, joy, wonderful memories and special traditions of your own!